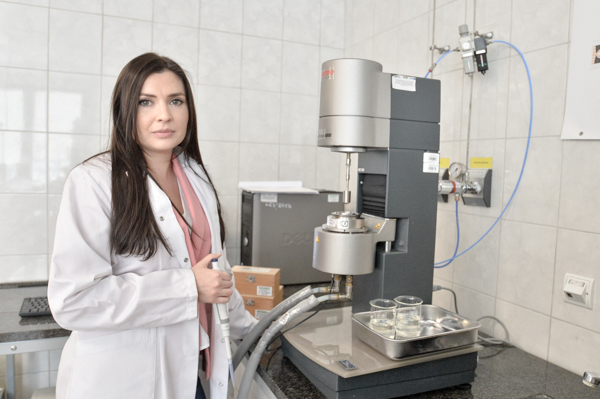 Dr Dominika Kulig PhD from the Department of Animal Products Technology and Quality Management works in a research team called “BioActive Team”, whose leader is Professor Andrzej Jarmoluk. - The aim of my PhD thesis was to create new materials which could be used as edible casings or protective films for food products, particularly raw and processed meat. These materials come from natural sources and were created on the basis of two biodegradable polymers – sodium alginate and chitosan. The alginate comes from brown seaweed and chitosan is a bioactive substance obtained from chitin present, for example, in the carapaces of crustaceans, so it is also a waste product of animal origins – says Dominika Kulig, who proved in her work that the combination of alginate and chitosan can extend the shelf life of raw meat by up to two weeks. A significant problem on the meat market are huge losses resulting from returns and disposal of worsened-quality or expired products. It is estimated that up to 20% of annual production is lost – an equivalent of 75 million cows. The materials doctor Kulig is working on have antibacterial and antioxidation properties which improve the product quality, durability and safety and their application may limit the use of chemical food additives or synthetic packaging materials. The “BioActive Team” creates innovative methods of food preservation and, although each person in the team conducts their own research, the whole work is supposed to improve the quality of food products. There are at least several scientific fields of interest – the team deals with, among other things, enzymatic modifications of polysaccharides and proteins, designing new nutrition forms like meat analogues or micro-encapsulation of bioactive substances. We make every effort to address the real problem in the industrial practice and the primary goal of our solutions and innovations is the improvement of food quality and guaranteeing good level of consumption safety – summarizes doctor Kulig. Dr hab. Anna Gliszczyńska from the Department of Chemistry received the award for her achievements on which she based her habilitation (postdoctoral degree), that is developing a new generation of environment-friendly biopesticides which selectively reduce populations of harmful insects, as well as preparations effective in prevention and therapy of cancer diseases, based on natural substances. While working on new insecticides, which are effective and non-toxic for mammals, I focused on two groups of natural compounds existing in plants – norisoprenoids (damascones) and jasmonates. These compounds play an important role in plant physiology as they are responsible for the interactions with other organisms in their neighbourhood and in the insect world they perform the functions of juvenile hormones and pheromones. I decided to use the biological potential of these natural substances and supply their skeleton with new structural elements such as a lactone ring or additional functional groups in order to obtain derivatives of increased biological activity. In this case these would be products effectively limiting insect activity but non-toxic to other organisms in the ecosystem and easily biodegradable. In order to obtain new derivatives of damscones and jasmonates, I applied the methods of organic synthesis and transformations carried out with the use of microorganisms – explains Anna Gliszczyńska – Other research efforts aim at creating a new type of bonds of isoprenoid compounds with phospholipids possessing therapeutic properties which could be applied as preparations with cytotoxic impact on selected lines of cancer cells, as well as chemopreventive properties. While working on modified phospholipids I took into account limited biological activity of isoprenoids in human body as well as their pharmacokinetics. Natural compounds, despite possessing a range of therapeutic properties useful for humans which could help with diseases of civilization, do not, unfortunately, have visible effects due to their too fast metabolism in our organism. Such is the case with, for example, isoprenoids. Dr hab. Anna Gliszczyńska stresses the fact that at this stage of research she is mainly interested in anticancer effects of natural compounds because, although cancers are now the second common cause of death (after cardiovascular diseases), the number of cancer cases is going to rise significantly and they will soon take the top spot both in Poland and in the world. For this reason I have synthesized such biomolecules in which the compounds of isoprenoid structure have been covalently attached to the skeleton of phosphatidylcholine commercially known as lecithin. Such an approach allowed me to accumulate within one molecule health effects of both these particles and, on the other hand, to obtain the derivatives of increased stability in the biological system and membrane permeability. In cancer diseases, the lymphatic system plays a significant role. Many diseases, such as lymphoma, plasmacytoma or leukemia, come from it and clinical observations suggest that also other types of cancer metastasize through the lymphatic system. It thus seems justified to create such biomolecules which may be transported by this system and work within it, which is possible to achieve for phospholipidic derivatives – explains Anna Gliszczyńska. Within her habilitation research she has obtained a series of phosphatidylcholines modified with isoprenoid structure compounds whose selectivity has been proved and for whom active doses have been determined which can affect cancerous cells of breast, lung and colon cancer, leukaemia as well as other types of cancers. At the same time they are not toxic towards healthy cells with undisturbed processes of proliferation. Science is a constant process basing on previous achievements in a given field and, at the same time, creating new ideas and solutions for the future. The work on phospholipids and lactone synthesis at the Department of Chemistry was initiated by Professor Czesław Wawrzeńczyk and I only continue and develop it basing on my knowledge and experience gained through working in other projects plus the latest publications from other research centres around the world. The academic achievements of Dominika Kulig consist of 12 original works (IF=24.294, and 335 Ministry of Science and Higher Education points, one patent, 41 scientific reports at Polish and international conferences (3 of which earned a distinction). For her research she was awarded a 1st level WUELS Rector team award. Dr hab. 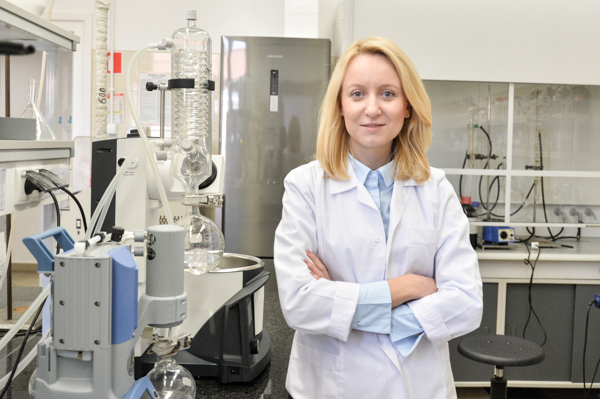 Anna Gliszczyńska, during her habilitation research obtained over 30 new compounds that have not yet been described in scientific literature. She has also proved their applicability as environmentally safe substances limiting the activity of some insects or their usefulness for biopreparations with anticancer properties. The obtained biomolecules and methods of their production are the subject of 16 patents.